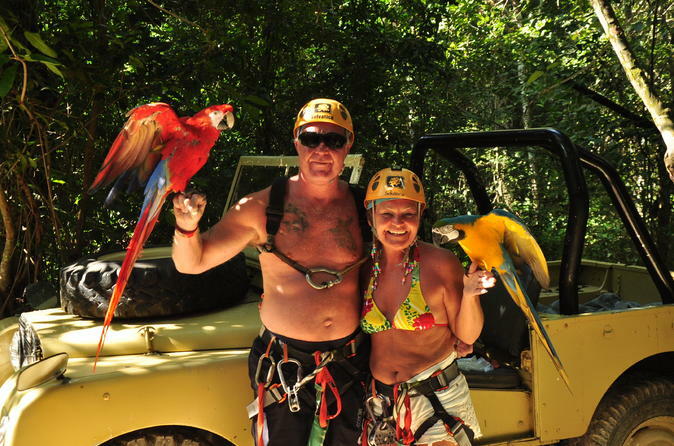 Eventyrsøkere får dobbel moro på en zipline over jungelbaldakinen og en ATV-tur på et off-road-eventyr fra Cancun. 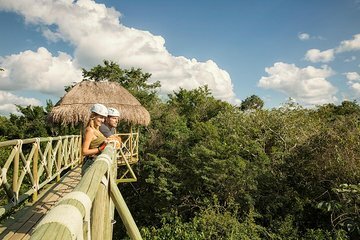 Besøk Central Americas største zipline krets for å oppleve 12 kolossale kabler suspendert over den meksikanske jungelen. Deretter ta kontroll over en imponerende buggy på en tur gjennom spektakulær natur. Oppdater i vannet i en cenote og fyll på med en lett lunsj før du kommer tilbake til hotellet. Avreise fra Cancun-hotellet i et komfortabelt minivan med aircondition. Når du kommer til zipline parken, får du en sikkerhetsopplysninger. På kort tid er du på den første plattformen i jungelenes treetops. Glide langs ultratynne stålkabler på 2,4 km av sporet til du kommer til spennende enden av kretsen. Oppretthold din naturlige høye ved å klatre ombord på Corona-buggy for en spennende tur på terrengsykkelbaner. Kjør rett til en hemmelig cenote, på bunnen av som krystallklart vann er badet i eterisk lys. Dyp inn i det glitrende sinkhole kjent som 'Lukama' for en forfriskende og revitaliserende dukkert. Tørk av og kom tilbake til rattet til din bil for å kjøre til en lokal restaurant til lunsj; feast på lokale og internasjonale retter som kylling fajitas, krydret ris, refried bønner og crunchy chips under den beroligende skyggen av en palapa. Når eventyret avsluttes, gå tilbake til minivanen og slapp av på reisen tilbake til Cancun-hotellet. LOVEDDDDD this tour! The tour guides are all soooo funny! They make your experience so much more enjoyable. The ziplines are so much fun, and you can go UPSIDE DOWN!! This was a great excursion, worth every penny! Staff was awesome! I would definitely go back to this place to try the other amenities! We had no idea what to expect for this tour we just knew we wanted to do it. I'm 56 yrs and my better 1/2 is 54 yrs we had a great time. The staff where a blast they all where full of energy. We felt very safe doing the zipline and the staff made sure we understood everything before we did the zipline run. One of the staff named Chris was so funny he made me feel great , I did have issues on height's at the start. After Chris relaxed be I had a great time . We both did the upside down run twice it was such an unreal feeling we are so glad we did everything that we did. With the off road buggy run the only glitch was they tried to put us into 1 buggy and to switch half way through the ride. I put my foot down and told them we paid for 2 buggies and they did end up giving us our own. Because of the rain the previous day there was lots of puddle's to drive through. This was so much fun we can't explain the adrenalin rush it was. Bring extra cloths don't wear saddles or running shoes for this tour. its best to wear those water shoes. At the end we were served a excellent meal we where even offered 2nds. after the meal a staff member showed us the pictures they took of us. This was so exciting to see the pictures they took. We ordered the full package something we both highly recommend to everyone . The book we ordered came to the hotel when they said, it was not what we expected it was even better very professionally done . We showed our book to several people at our hotel and they booked this tour after seeing our picture album. If we ever want to go back to this area we will book to go back and do this tour. Absolutely amazing!! We did this excursion in the pouring rain and it only made it more fun. Add this to your list of must-do's! A fabulous experience with a very, very attentive crew--I felt completely safe with them. I'll definitely recommend that adventure to my friends.